A week before Interbike I’d posted about Ultra Mobile Bike Devices and connecting an iPod to a bike. 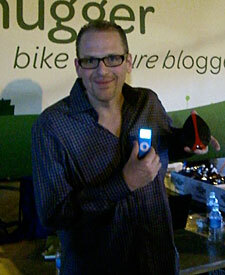 Remarkably during the Hugga Hookup we met Cy-Fi, an iPod speaker and remote for your bike. Good timing! I did test ride and video the Cy-Fi, but it was too dark and the video didn’t turn out well. The device itself was cool and the owners of the company were very proud of it. Using new technology, from Kleer, it’s an iPod remote that connects to speakers you mount to your handlebars. What’s unique is that the speaker has buttons to change the track, volume, and select playlists. Sure, sure, a DIYer could just duct-tape some speakers to a wire and an iPod. Maybe just wear headphones, but if you’re at Critical Mass or a bike parade with the Rock the Bike crowd, you can blast your Bombay Dub Orchestra for everyone to hear.